The W05 is Mercedes' purpose built F1 car for the 2014 regulations, attempting to exceed the results of the W04 during the year before, during which Mercedes finished second in the Constructors' Championship. The car had its shakedown on 24 January at 14:21 at Silverstone Circuit before it was shipped to Jerez, Spain for the first winter test. Early in the morning of the first day of testing it was also officially launched in the pitlane with drivers Nico Rosberg and Lewis Hamilton unveiling it to the public. 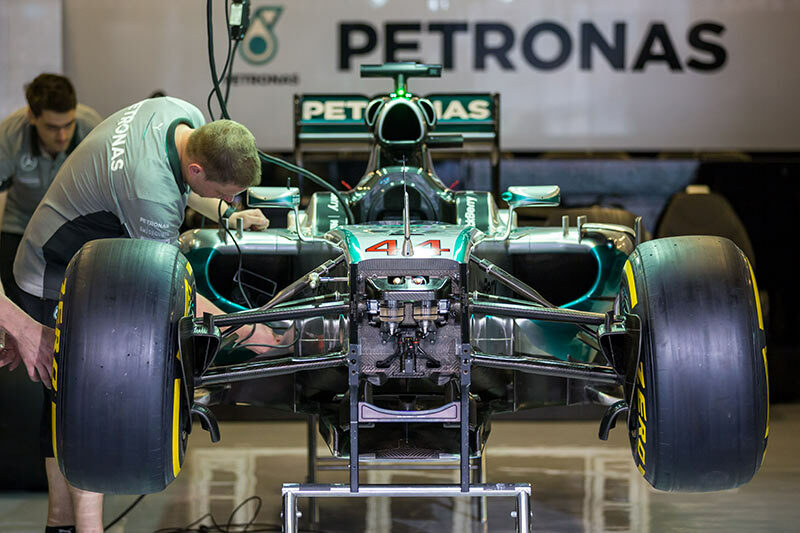 Technically, the car includes the Mercedes-Benz PU106A Hybrid through which the team was able to benefit from close cooperation between the chassis and engine department, something that is a major advantage compared to teams that are customers for the engines. Underneath sleek sidepods is about twice the radiator surface compared to 2013 due to increased cooling requirements from the electrical components and the turbocharger. Still the team appeared to have managed a fairly tight package, even on its launch car. Remarkable features as of the launch were a highly developed front wing and an interesting solution to the nose cone regulations. To match the minimum section 50mm behind the tip of the nose, the team designed in inverse U-section. This section was not part of the crash test, but instead only designed to match the dimension regulations, along with supporting the front wing through 2 very short pylons that attached on each side of the nose. This makes it a very low nose cone, similar to Ferrari's design at Jerez, albeit that Ferrari did not thicken the front wing pylons to meet the regulations, but instead had a somewhat thicker central section of the nose. The front suspension is also of particular interest as the lower wishbone pickup points are closely behind each other in an attempt to use the suspension elements to the aerodynamic benefit of controlling the upwash generated by the front wing. The lower tub and nose also mean that the front push rod suspension features slightly more horizontal wishbones while the pushrod rocker itself is covered by a small aerodynamic panel just behind the front bulkhead. Again, this is a regulatory workaround to try to have the tub as high as possible, increasing airflow underneath. Mercedes also decided to align the steering arm with the frontal upper wishbone for aerodynamic purposes while other teams stepped away from this approach years ago. The rear end proved more traditional in the Jerez version, with the rear wing being mounted on two pillars, bending around the central exhaust pipe that is aimed slightly upward, as much as the regulations allow. The rear suspension meanwhile is still a pull rod design, by then a commodity in Formula One. The car soon proved fairly reliable compared to its competitors, but on day 2 of the Jerez winter test, a broken front wing caused Lewis Hamilton to crash off, requiring the team to fly a new front wing over from Brackley to continue testing the next day. The hiccup did not provide a real setback for the team, as others were struggling badly with their new power units. By the second and final pre-season test at Bahrain, Mercedes clearly emerged as the leading force with its car running reliably whereas the Renault powered teams continued to struggle with electronics and heat expelled from the turbo and energy recovery systems. 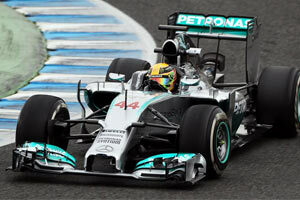 Management of this heat was a particular strength of the car's power unit, the Mercedes PU106A. Uniquely on the engine are its separate turbine and compressor, with the compressor located at the front of the engine, connected with a shaft towards the compressor, located behind the cylinder banks. In between the two, Mercedes neatly packaged the ERS-H motor, allowing for a tight overall package. Did Mercedes take a close look at the RB10?